On July 6, 2016, South African sprinter Oscar Pistorius was sentenced to six years in jail, following the murder of his girlfriend and model Reeva Steenkamp in 2013. To date, he has served just over a year of that six-year sentence. A South African court on Friday rejected an appeal of state prosecutors aiming to increase the sentence of Paralympic champion Oscar Pistorius. South African High Court sent Paralympic gold medalist Oscar Pistorius to prison for 6 years for murder of his girlfriend in 2013. A sentence in the legal case of Olympic and Paralympic track star Oscar Pistorius will be handed down in July, according to media reports. South Africa's National Prosecuting Authority (NPA) has issued an arrest warrant for Olympic and Paralympic track star Oscar Pistorius, the eNews Channel Africa reported Friday. A paralympic sprinter Oscar Pistorius was released from prison and placed under house arrest. 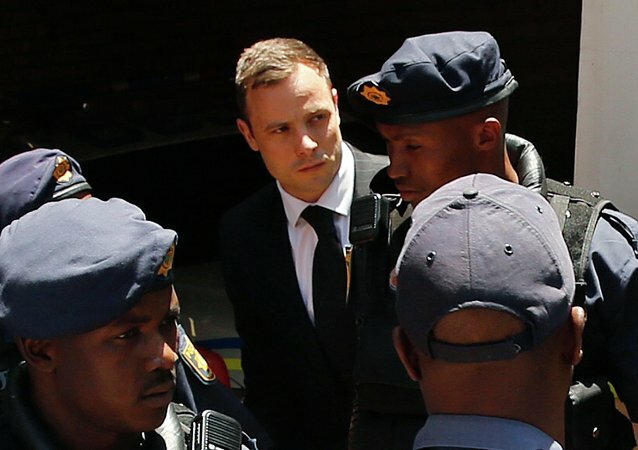 South African six-time Paralympic champion Oscar Pistorius, who was sentenced to five years in prison for culpable homicide, has reportedly arrived at the Kgosi Mampuru Prison. The family of Reeva Steenkamp have welcomed the verdict of the High Court in Pretoria, which delivered Oscar Pistorius a five-year sentence of which 10 to 20 months he will spend in jail. Six-time South African Paralympic champion Oscar Pistorius was sentenced to five years in prison on Tuesday for killing his girlfriend Reeva Steenkamp. Pistorius, who won two gold medals at the 2012 Summer Paralympics, has been sentenced to five years in prison for culpable homicide in the death of his girlfriend Reeva Steenkamp. South African Paralympic athlete Oscar Pistorius has been sentenced to five years imprisonment for committing culpable homicide of his girlfriend Reeva Steenkamp. Earlier, defense attorney Barry Roux said that the six-time Paralympic champion Oscar Pistorius should be given community service. Correctional services officer Joel Maringa has told the court on Monday that South African amputee sprinter Oscar Pistorius should be subjected to three years of community work instead of incarceration. 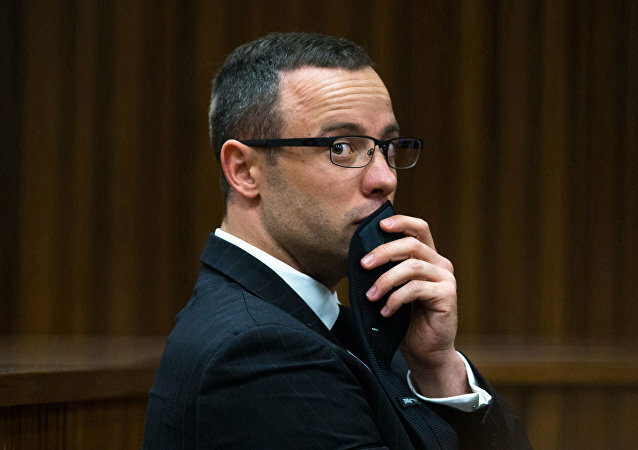 Psychologist Dr. Lore Hartzenberg has stated that the remorse and pain Oscar Pistorius is going through following the shooting of his girlfriend Reeva Steenkamp are genuine, Sky News reported Monday. South African amputee sprinter Oscar Pistorius has arrived Monday at the Pretoria High Court for the sentencing hearing in which his punishment for killing his girlfriend Reeva Steenkamp will be determined. Reeva Steenkamp's mother, June Steenkamp is shocked by a court decision on Friday to acquit Oscar Pistorius on charges of murdering her daughter, according to reports released Saturday. A South African judge on Friday found Olympic and Paralympic athlete Oscar Pistorius guilty of culpable homicide for shooting his girlfriend Reeva Steenkamp, Reuters reported. The trial of South African athlete Oscar Pistorius, who is charged with murdering his girlfriend Reeva Steenkamp, has been adjourned for the day and Judge Thokozile Masipa will continue delivering the verdict Friday. South African athlete Oscar Pistorius genuinely believed there was an intruder in his home and thus cannot be accused of murdering his girlfriend Reeva Steenkamp, who died after Pistorius shot at her through the bathroom door, Judge Thokozile Masipa said Thursday as quoted by The Sydney Morning Herald. On September 11, 2014, a verdict will be passed in the case of Oscar Pistorius, a six-time South African Paralympic champion, who is accused of murdering his girlfriend.